Yay! My favorite time of the year is approaching... the crunchy leaves, the cooler nights, the return to hot dinners and NO MORE SWEATING! I've been sweating a lot lately for daughter and I switched rooms. She's back in her old bedroom upstairs, and I moved my scrapbook room to the basement. I have more room AND a TV to watch while I craft! Woot! She has her comfy room back which makes her happy too. So it's a win-win! But MAN. What a lot of work! Moving all that crap, er stuff was tiring. And setting everything up again was time consuming... if you're ever going to do this madness, here's a hint for you. Take photos BEFORE you move your crafting stuff. Luckily, I did this and it saved me so much time. I knew exactly how I had my wooden stamps displayed in their printer's drawers (mounted on the walls), how I arranged all my inks, glitter, and tiny bottles in the Embellishment Center, how I had my punches organized and how I had my desk set up. Whew! It could have been a lot worse without those reference photos to use. I chose Edwin With Butterfly, except I guess I should really call it "Edwin WITHOUT Butterfly" for this card. Yeah, I cut off the butterfly and added a pine cone for Fall. I love stamps I can change up easily. With Edwin's hand out like this, it's a breeze to put anything in it! After I chose the stamp to use, I hunted through my papers for a Fall-themed design. I found this ProvoCraft "Fluttery Things" paper and cut out a corner, carefully going around the leaves to create an interesting shape. I mounted the patterned paper onto three layers of cardstock. Using my Cricut, I got out the "Give A Hoot" cartridge and cut out the pine cone in brown and green. 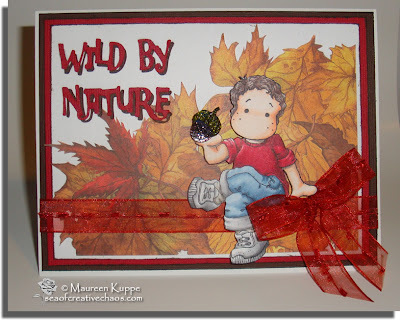 I used All Night Media's Clear Gloss for the pine cone and some Peeled Paint Distress Stickles on the pine cone cap. I also used my Cricut and the same cartridge for the sentiment; I thought this would make a good Boy's Card. A simple bow (made with my Bow Easy, natch) from some Celebrate It Harvest ribbon is all the other embellishments I added.